I had completely forgotten about KDO. It’s held every September in the Harrisburg PA area. I had not been there for several years. Part of the reason was probably because twice I signed up for classes and twice I had to cancel. Was somebody trying to tell me something? When I got Beth Brown-Reinsel’s monthly newsletter, I had an urge to go. It was too late to get into any classes, but the market had several dealers that I did not recognize. I told myself that I had already taken Beth’s classes, but Nancy Bush had one that I would have liked to take. Oh well. I would have to be happy with the market. The trip would take an hour and a half from Reisterstown. A companion would be nice. I immediately thought of my friend Diana. After a few e-mails and a phone call, we were all set. She showed up about 15 minutes. I just knew that was going to happen, but I still didn’t manage to get myself ready on time. I reminded myself that we were just going to the market. The trip up was a bit of a headache. US83 was had more tractor-trailers than anything else. You’ve got to watch them. There’s no telling when they will fall over on you. We managed to get to our exit without being flattened. And it was closed. CLOSED??!! Thank goodness for GPS. We made so many turns that I had no idea which direction I was going. The rest of the trip was uneventful. I am so glad Diane was with me. The whole market took less than an hour. It was fun. Except for Manning’s, the dealers were all new. We both found something to buy so the trip was successful. I had to buy sock yarn. 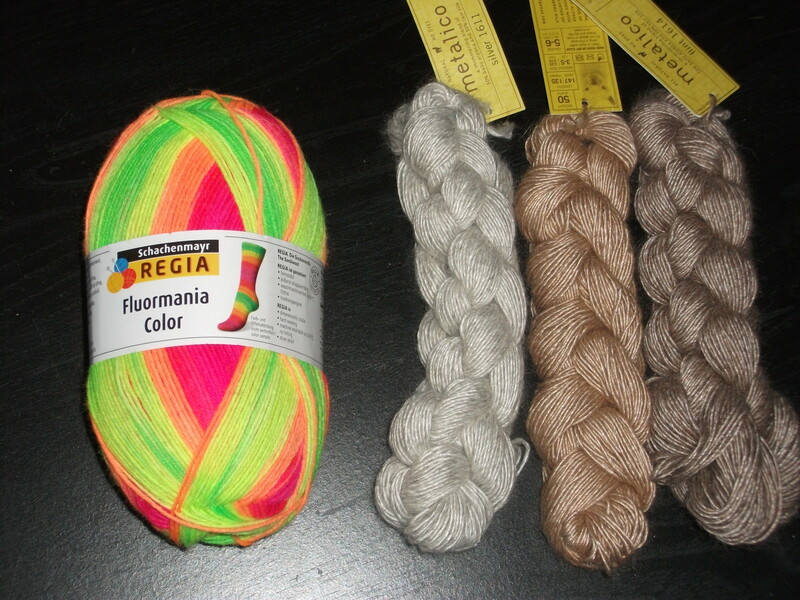 I also got some alpaca/silk from Blue Sky. Diana found some pretty fleece. She likes to spin and weave.